Lake Independence area rep Cordel Hyde is the acknowledged field general of the P.U.P. in Belize City. It will be his task to shepherd voters to the polls for Bernard Wagner and the P.U.P. slate of municipal candidates, but as he acknowledged on Sunday, it won’t be easy. Wagner and his team face twelve years of U.D.P. rule with Dion Leslie moving up to the top spot for the first time. Hyde told us that the P.U.P. will be disciplined for a long, hard-fought road to potential victory on March seventh and that voters will finally get a real choice. 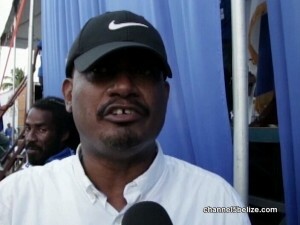 Cordel Hyde, Deputy Leader, P.U.P. Bike Ride Raises Thousands for F.C.D.